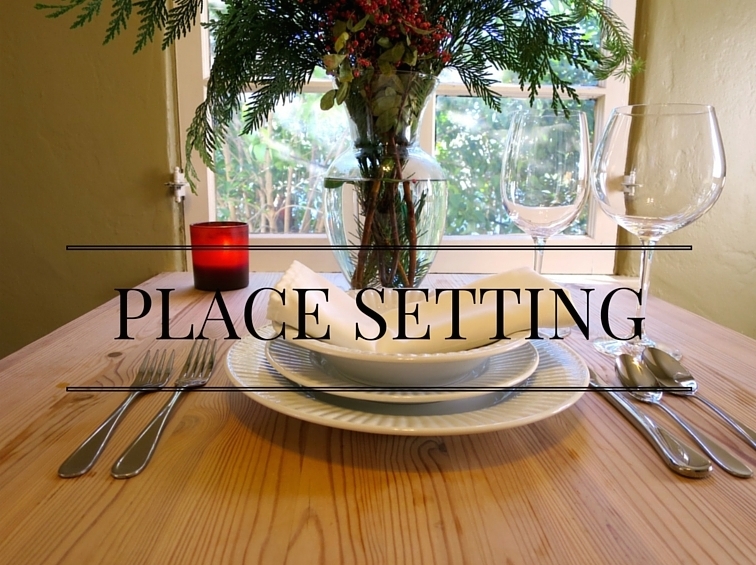 "informal" place setting, a formal place setting can get a bit more confusing with a lot more dishes and utensils. Most people do not pay attention to how a table is set or why, but a properly set table is quite symmetrical. If you ever get confused with which utensil to use always remember to start on the outside and work your way in. For example we usually start with soup and/or salad, the soup spoon is placed on the outside, right and the salad fork is on the outside, left. The fork is place on the left because the knife is on the right which you will need to cut your food and if you are right handed you will more than likely cut with your right hand. This setting is inconvenient for a lefty but unfortunately we live in a right hand world. The plates and bowl should be placed in the middle with the napkin on top. The water glass should be in front and the wine glass to the right. Before being served you will place the dinner napkin neatly in your lap.